A trip from Kyoto Station to Inari on JR Nara Line takes only 5 minutes. 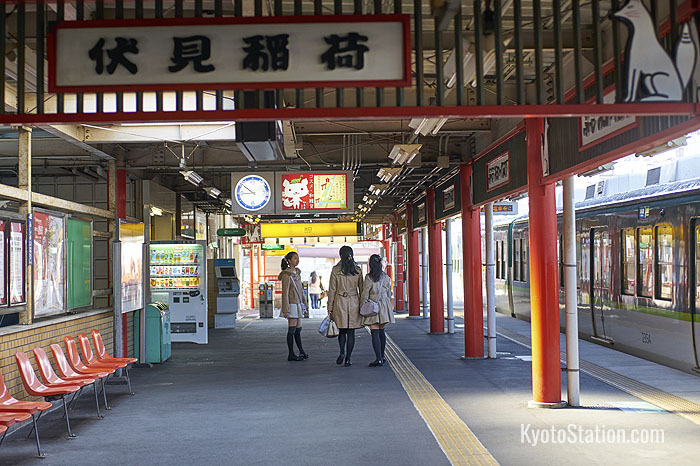 JR Inari Station opens directly before Fushimi Inari Taisha Shrine. Please note that only local trains stop at Inari Station. There are a number of express trains operating on JR Nara Line. If your destination is Inari, you will have to take a local train. The Keihan Line also has stations at Tofukuji, Inari and Uji. Whether you take the JR or Keihan lines will depend on where you are in the city. If you are in a more central location, and closer to Keihan stations such as Sanjo or Shijo, the Keihan Line may be a better option. Fushimi-Inari Station is a short walk from Fushimi Inari Taisha Shrine.